Fraser Kerr signed for Hartlepool from Gateshead in February. Hartlepool United defender Fraser Kerr has backed his former team-mates at Gateshead after they threatened to go on strike at the crisis-hit club. The 26-year-old centre-back has stayed in touch with his old pals following his difficult decision to leave the International Stadium. 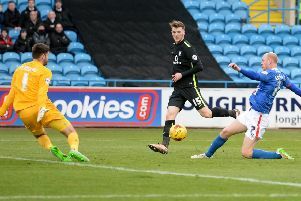 Kerr signed for Pools back in February and has been a regular for Craig Hignett’s side since arriving at the Super 6 Stadium. Meanwhile, Gateshead’s off-field issues have intensified in recent weeks, with players and staff facing late payments, issuing a joint statement for the current owners to leave, and threatening to go on strike. Kerr, who made 35 league appearances for the Heed earlier in the campaign, admits it’s been difficult to watch but has praised the Gateshead players for the way they’ve reacted. “Obviously it was a very tough decision for me to leave Gateshead the team was doing really well but what they’re going through from a player’s point of view is not nice to see,” said Kerr. “You feel for the fans there and you feel for the players, through mismanagement they’re in this situation and it’s out of their control. “I still speak to a few of the boys as well and obviously there’re not too happy with the situation. Kerr is now looking forward to a new chapter through, and has praised the Hartlepool fans and staff, as well as his new team-mates, for helping him settle in. “I’ve settled in brilliantly, the boys have been brilliant, the coaching staff, everything about the club, I’ve settled in really quickly,” said the 6 ft 2 centre-back. “The fans have been brilliant and the games we’ve played here, especially the 3-2 game to win in the last minute, that was brilliant.